Steven Angrisano is undoubtedly one of the most effective and versatile ministry leaders in the Church today. Young and old alike embrace the passionate message of faith, hope, and love woven throughout his music and storytelling. Always rooted in a spirit of humility and faithfulness, Steve’s honest style of ministry is born from who he is: a committed witness to the life and love of Jesus Christ. Steve’s unique blend of humor, song, story, and interaction engages audiences of all ages. This makes him both a natural and popular choice for parish missions, youth conferences, and diocesan, national, and worldwide events. 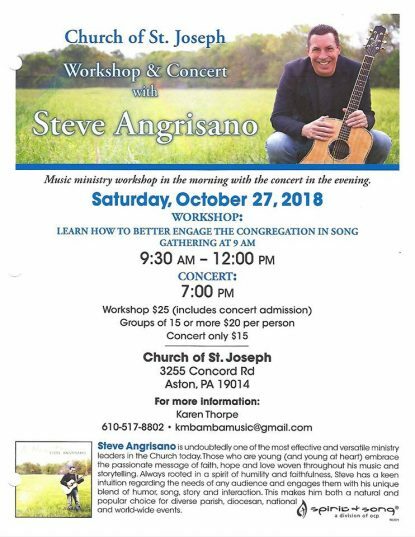 A veteran musician and composer, Steve has been featured at Six World Youth Days, the National Pastoral Musicians Conference, the Los Angeles Religious Education Congress, and many other national and international events.